Bryan Municipal Utilities is dedicated to protecting and maintaining the high quality of Bryan’s public water supply. As part of our protection efforts, the Bryan Water Department maintains a backflow prevention and cross-connection control program. Backflow is the undesirable reversal of flow of water, leading to contamination into the distribution system of a public water system. All cross connections pose a potential health risk. The Ohio Environmental Protection Agency requires backflow preventers to be tested every 12 months by a certified tester. Any backflow device test that does not meet the requirements shall be repaired promptly. This test is required under Bryan Municipal Utilities Cross Connection Control Program, which carries the approval and is mandated by the Ohio Environmental Protection Agency. Updates were recently made to the City of Bryan’s Cross Connection Control and Backflow Prevention Program (Bryan City Ordinance No. 4, 2015). Who Must Test a Backflow Device? What about Lawn Irrigation Systems? Lawn irrigation systems are also required to have a backflow preventer installed and maintained. They are just more than fittings installed on your system; they are designed to protect our public water supply and prevent illness. 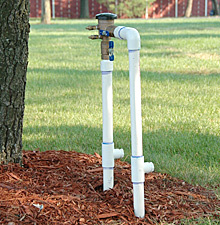 Lawn irrigation backflow devices also need to be tested promptly when notified by the Bryan Water Department. Any customer that is found to be in violation of the City of Bryan’s Cross Connection Control and Backflow Prevention Program is subject to a monetary fine or disconnection of water service. The Bryan Water Department appreciates your efforts to ensure the safety of the public water system and all of the consumers that rely on it every day. If you have any questions regarding your backflow device, please contact staff at the Bryan Water Department for further assistance.